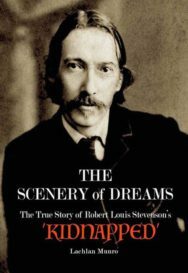 Inspired by the author’s retracing of the footsteps of David Balfour and Alan Breck from Mull to Edinburgh, The Scenery of Dreams traces Stevenson’s inspiration in writing Kidnapped, one of the world’s best-loved adventure stories – the book that Stevenson himself was most proud of. The extraordinary feature of Stevenson’s classic, however, was that for the most part it was true, inspired by real characters and events, and this offers his readers a glimpse, not only of his creativity, but into a fascinating period of Scottish history – the aftermath of the Jacobite Rebellion of 1745. The book is also full of Highland tales and folklore, and insights into a vanished world of clan warfare, and romantic adventures, as the extraordinary lives and fates of the real characters are explored, and offers a living, breathing portrait of Stevenson himself, and his own adventures.